Summary: After her best friend Cali dies in a senseless car accident, Lexi turns to silence in response to her feelings of grief and guilt. Through court-appointed volunteer work, Lexi is assigned to be a companion for Joanie, another seventeen year-old girl who lives at the hospital. Joanie is also silent, but her silence is because of a neuromuscular disorder, not by choice. Together, Lexi and Joanie both find their voices through a blossoming friendship, and the use of a computer called the Wizard that can read Joanie’s eye movements. When their friendship comes to an untimely end, Lexi is left to pick up the pieces of herself and figure out how to move on. Review: A complex yet sensitive read, The Color of Silence by Liane Shaw gives readers a window into the perspective of a teenage girl dealing with a neuromuscular disorder. Joanie is at the whim of her body and unable to communicate as others do without assistance. Lexi’s companionship opens up new opportunities for both of them, as well as a deep friendship that goes beyond words. Though the characters are believable and thoughtful, I had a hard time reading this book because of the subject matter. I find myself triggered when it comes to reading books about hospitals, and while I was happy to read a teen fiction book about a character with a neuromuscular disorder, because I have one myself I wanted more specifics about what type it actually was. I was also very disappointed when Joanie died, as so many books about teens dealing with illness end the same way. But for those who don’t have the personal experience that Joanie has, The Color of Silence is an eye-opening, lyrical read. I loved Lexi’s journey through grief and how she blamed herself for her friend Cali’s actions. In the face of such a random accident, it was easy to empathize with Lexi and understand why she would keep replaying how she could have done things differently in her head. An emotional and enjoyable story geared toward younger to mid female teen readers, I’d recommend Shaw’s book for those looking for character development and insight. “I actually use words very well. I have listened to stories and movies and plays and people talking around me and to me for seventeen years. I am so full of words and thoughts and images that if I ever could figure out a way to let them loose, they would come swirling out of me in a torrent of syllables, sweeping aside anyone unlucky enough to be standing in their path. I would fill every room with the colors of my dreams until the whole world became a rainbow of my making. “For a long time, all I did was cry. But it didn’t make the pain go away. It just made it wet. “They feel sorry for me. Not in the apologizing kind of way but in the way that says they think my life is somehow less because it is different. “From what I can see and imagine, it seems as if anger usually comes when people think they don’t have control over some part of their lives. The feeling of being unable to change something no matter how much you want to seems to fill people with storms. I have no control over any aspect of my outside life. I should be filled with wind and rain and dark clouds that threaten me every moment of every day. But I’m not. There are clouds in there sometimes, definitely, but mostly I want to be filled with sunlight and rainbows and things that make my life better, not harder. But maybe it’s because I never had the control in the first place, so I was never faced with losing it. “Being sorry doesn’t make it go away. Being sorry doesn’t make it all right. Being sorry doesn’t make time go backward so you can fix it. Being sorry doesn’t make you a better person. Being sorry doesn’t bring people back to where they’re supposed to be. 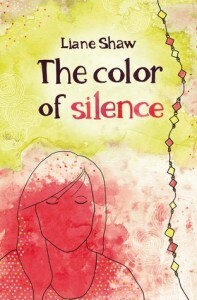 The Color of Silence by Liane Shaw is published by Second Story Press, (2013).